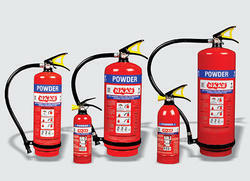 Our product range includes a wide range of abc type fire extinguisher and fire extinguisher carbon dioxide wheel type. Dry Chemical Powder ISI Mark ABC (Stored Pressure) Mono Ammonium Phosphate Base Fire Extinguisher conforming to IS: 15683: 2006, Powder conforming to IS: 14609 with ISI Mark, Duly Pressurized by Nitrogen Gas, Controllable Discharge Valve Fitted with Pressure Gauge, Discharge Hose & Nozzle, Internal External Powder Coated as per IS: 538. 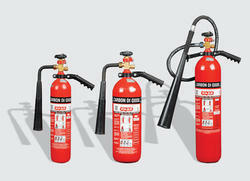 Carbon Dioxide ISI Mark CO2 Type Portable Fire Extinguisher Conforming to IS 15683:2006, Gas Confirming to IS: 15222’, Cylinder Confirming to IS: 7285’ & PESO approved, Controllable Discharge Mechanism, Discharge Hose & Horn.